Cedar Lodge is the best self catering holiday cottage that we have stayed in. Everything is perfect including cooking stuff. Kids really enjoyed their stay. Thank you very much for this welcome. Thank you Andy for explaining the beautiful places in Fort William. 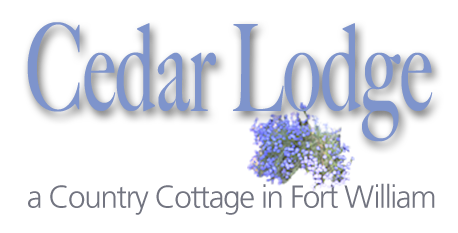 we will definitely recommend our friends to Cedar Lodge. This was our second visit to Fort William (the last being October 2013). On both occasions we stayed at Cedar Lodge. We were greeted with a warm welcome and the accommodation exceeded our expectations. Mrs McKenna has thought of everything from milk in the fridge to fresh flowers on the table – we appreciate the personal touch – a true home away from home. Another bonus was the beautiful weather all week – did not expect to get a slight tan !!! One of the best self catering accommodation that we have stayed in over the years in all differnet parts of the world. Like a home from home. Everything here to make our stay very comfortable and warm. Ideal location for touring the Highlands and Islands. Would highly recommend to friends and family. Would give it a 5 star rating. Unfortunately we have to go back to Germany now ! We would like to thank you for your very comfortable accommodation during the last two weeks. As newcomers to Scotland we were very appreciative about your warm welcome and your many hints for discovering the area around Fort William. We are sure to come back ! We had had a lovely 4 days in Fort William at Cedar Lodge. The views from our windows are magnificent and our hosts Randi and Andrew, very friendly and helpful. Cedar Lodge us well fitted out and comfortable. Would not hesitate to recomend to to family and friends. Your cottage provided an excellent base for our vacation – comfortable and well-equipped and a cosy shelter from the rain! Managed to avoid some of the worst weather with the help of the BBC forecast. Thoroughly enjoyed the walks in Glen Nevis, the Jacobite train, Inverness and stops en-route. Made it to Skye and miraculously saw the Cuillins clearly on a beautiful, sunny day. Didn’t make 1 hour to the summit of Ben Nevis this time! The Highlands are a beautiful area of Scotland even though it is a bit damp. I just wanted to drop you a line to tell you what a wonderful time we had last weekend while staying at Cedar Lodge. The standard of accommodation and attention to detail were superb, and was the perfect basecamp for our weekend activities. The whole experience was surely enhanced by the use of your facilities, and rest assured I will be keen to book again in the future should the occasion arise, and will be recommending Cedar Break to anybody visiting the Fort William area. Thanks. It’s nice to stay at Cedar Lodge but too short! We hope to come back next year. Everything was fantastic! We all had a really good time. Thanks again. We had a great time staying at Cedar Lodge. The accommodation was very good and the location was superb. We were made to feel very welcome during our stay and the result was a very relaxing holiday. The children enjoyed playing in the gardens and had a great time too. We hope to return soon. We loved our week in the Highlands and especially our stay at Cedar Lodge. You made us feel welcome and so comfortable. The location is ideal for exploring the area or for just taking a walk out your back door. Thanks for the travel tips and weather forecasts and the thoughtful amenities you’ve included for your guests. We hope to return for another visit in the future.